People like lists, or at least the idea of lists. Most of us don’t like to be disorganized, and lists seem to help us get our act together. Grocery lists, to-do lists, Christmas card lists, all move us toward doing what we gotta do, even if we don’t get it all done. The Ten Commandments constitute a list, mostly of what not to do. The Sermon on the Mount contains another list, identifying more positively what to do instead. These biblical lists carry messages about how to live. They are revered as kernels of Old and New Testament wisdom, even by people who disagree with each other about what the items on each list really mean. There is a little-known American list that deserves attention. It can be found in the middle of Martin Luther King Jr.’s first book, Stride Toward Freedom. This book, first published in 1958, recounts the story of the Montgomery bus boycott of 1955-56. In a chapter called Pilgrimage to Nonviolence, Dr. King sets forth his list of six principles of nonviolence. The bus boycott was notable for several incidents in which white resistance to the black community’s desegregation efforts took an ugly, violent turn. On one occasion, the Kings’ house was bombed. An angry crowd of King supporters wanted to take immediate revenge, but he told them to cool off and go home. King knew that resorting to violent retaliation would cost his movement its credibility. He also knew that any chance of reconciling people in this conflict rested on the commitment he had made to nonviolence. Throughout the productive years of the Civil Rights Movement, nonviolent leadership and training produced several successes that earlier approaches had not. Yet King’s principles of nonviolence never became a nationally familiar framework for solving problems. Stride Toward Freedom was never widely adopted in U.S. schools, and, shamefully, it was allowed to go out of print after King’s assassination. This is a time in which some Americans think that arming everyone and threatening to use violence is the way to respond to perceived threats. It is a time when horrific acts such as suicide bombings confirm the fears of many that there is no hope for peace. It is a time when thuggish politicians in many countries model impatience, disrespect, and hostility toward their opponents. Must we settle for a toxic response to toxic conditions? Or is there another framework within which we can address difficult problems and conflicts more positively? Perhaps this is a time when we should revisit a set of principles that were undeniably effective in making America a more civilized nation. http://www.thekingcenter.org/king-philosophy#sub2. Each is accompanied by a brief comment. In King’s day, it took courage for his followers to face real threats of physical violence at the hands of white segregationists. More generally, nonviolence calls for the courage to stand up against injustice and violence, and to do it early on, before people fall into vigilantism, war-fever, and vengeance. King was acutely aware that enemy thinking deludes people into believing that their opponents are worthless and evil. Our opponents are human beings very much like ourselves, and what would work with us has a good chance of working with them. Every good program for resolving conflicts cautions that it is a mistake to reduce problems to personalities. The idea that a conflict will be resolved by removing one problem person is usually unrealistic and counterproductive. 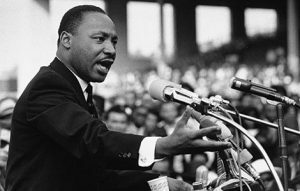 King asked his followers to put themselves in danger, and to make significant sacrifices for the cause of civil rights. He was not advocating suffering for its own sake, but reminding people that achieving a great goal will require us to pay our dues. The Greek word for loving goodwill toward all people is agape. King proposed that internal violence of the spirit – hatred, resentment, hostility – be replaced with agape. For him, nonviolence clearly went beyond opposition to physical violence. For King, God, and therefore reality, provided tools and rules that could help the cause. In his later Letter from Birmingham Jail (1963), he expanded on this topic, stressing that although the universe is on the side of justice, the cause of justice also needs us to pick up those tools and help. Upon being introduced to King’s principles of nonviolence, participants in our classes and workshops generally want to talk – a lot. Some disagree with one or more of the principles, or are so challenged by them that they will not readily accept that they are workable. Most wonder why they haven’t heard of this list before. Many people find that these principles express in words their own beliefs about how to live with others. A workshop leader doesn’t have to say much during such discussions. The principles seem to tap into a deep well of wisdom and caring in most people. This is one list that deserves more attention than it is getting. Adapted from an article that first appeared in The Frederick (MD) News Post, January 12, 2008.